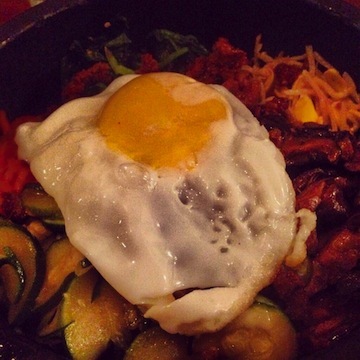 Mandu | Gluten Free D.C.
What I got: Dolsot bibimbap, a rice bowl with veggies, beef & sunny-side up egg. Gochujang, a spicy chili and bean paste, is served on the side. This dish is served in a hot stone bowl that enhances your food in a way you could never have imagined. The slower you eat, the longer the rice cooks. You don’t want to miss the fantastic, crunchy taste. Dolsot bibimbap, a rice bowl with veggies, beef & sunny-side up egg. Gluten-free friendliness: Not only does Mandu have more than a few gluten-free options, but their menu does a great job of indicating which dishes cater to special diets. The menu key includes a “V” for vegetarian, “G” for gluten-free and “X” for the substitution of tofu, chicken or pork for beef in the two bibimbap dishes. Some dishes I can’t wait to try are galbi-tang (a beef short rib soup with radish, green onion, clear potato noodles and eggs) and chap-chae (stir fried clear potato noodles with veggies and beef). Overall vibe: This place was packed, and for good reason! 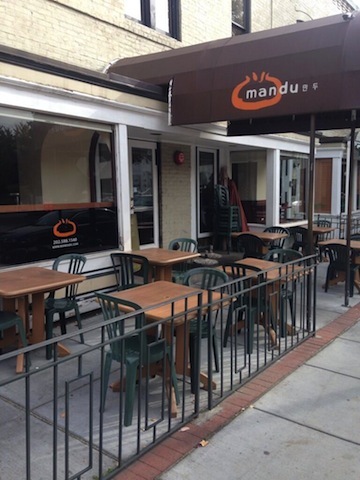 Mandu exudes warmth and intimacy created by candlelit-tables, friendly staff and steaming hot food. Everything about the restaurant feels and tastes upscale, except the price. Leave your puffy winter jacket at home, though, and bring your indoor, quiet voice — the tables are fairly close together. This entry was posted in Chinatown, DuPont and tagged BBQ, Chinatown, D.C., Dinner, Dupont, GFDC, GlutenFreeDC, GlutenFreeDiet, GlutenFreeFoods, GlutenFreeRestaurants, Korean, Washington. Bookmark the permalink.